Cant believe this? mGinger is gonna spice up your life through your mobile. 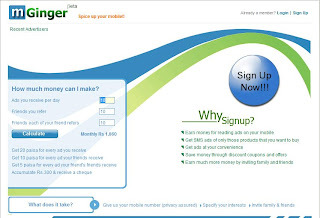 Just sign-up with mGinger and start receiving ads on your mobile. You will get paid 20p for each ad you read on your mobile and 10p for each ad your friend reads on his mobile. When you are done with 300 rs in your account, you will be paid through cheque from mGinger. So, just sign up and spice up your life.